Exciting prizes await winners of the 10th Phoenix Open Golf Tournament which will tee off on March 17, 2018 at the Rancho Palos Verdes Golf and Country Club in Davao City. One million pesos, a Harley-Davidson 1200 Roadster, a Mercedes-Benz B-Class, two Tata Manza INI cars, and P100,000 worth of Phoenix Petroleum fuels and lubricants will be awarded to the hole-in-one winners. Every player will also have a chance to win a brand new Tata Manza Petrol and other great prizes in the raffle draw during the awarding ceremony. Team, partner, and individual division winners will each receive a Royal Selangor Pewter Plate and Phoenix Petroleum fuel cards. Champions will also bring home limited edition Phoenix signature golf bags. The annual Phoenix Open is part of the Araw ng Dabaw festivities in Davao City. 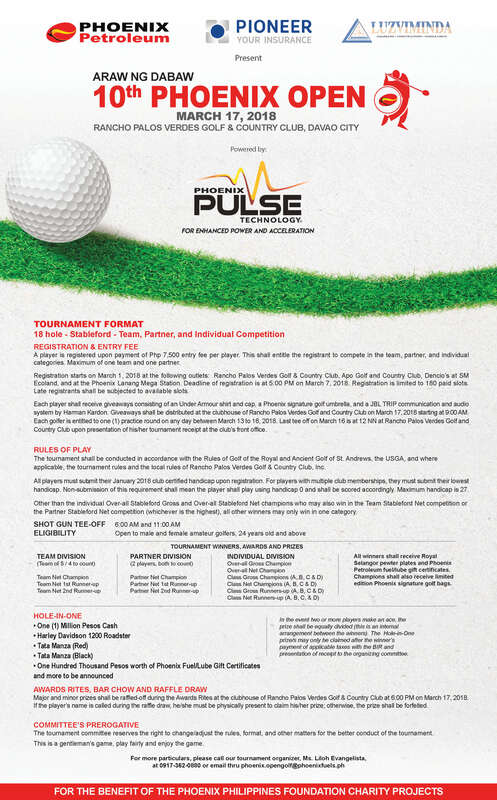 The tournament is open to male and female amateur golfers age 24 years-old and above. Registration is ongoing at the following outlets: Rancho Palos Verdes Golf and Country Club, Apo Golf and Country Club, Dencio’s Kamayan at SM City Davao-Ecoland, and at the Phoenix Mega Station in Lanang, Davao City. Deadline of registration is on March 7, 2018. Entrance fee is P7,500 per player to qualify in the team, partner, and individual categories. An Under Armour shirt and cap, a JBL Trip communication and audio system by Harman Kardon, and a Phoenix golf umbrella will be given to each registered player on the day of the tournament. Each registrant is entitled to one practice round on any day between March 13 to 16, 2018 upon presentation of the tournament receipt at the Rancho Palos Verdes Golf and Country Club’s front office. About 200 players are expected to hit the greens in this milestone year of the annual Phoenix Open, a fundraising event of Phoenix Petroleum Philippines, Inc. for the benefit of the Phoenix Philippines Foundation and its projects on education, environment, health and safety, outreach, and other future initiatives. On its 10th year, the Phoenix Open is made bigger with the addition of two more legs: the Phoenix Invitational Golf on May 11, 2018 at the Manila Golf and Country Club, and the Phoenix Golf Open on June 22, 2018 at the Cebu Country Club, where golfing enthusiasts from all over the Philippines and even outside the country are expected to gather. The 10th Phoenix Open Golf Tournament—powered by Phoenix PULSE Technology—is held in celebration of the 81st Araw ng Dabaw, the home of Phoenix Petroleum. It is presented by Phoenix Petroleum, Luzviminda Engineering, Marra Builders Inc., and Pioneer Insurance, and co-presented by F.F. Cruz & Co., Inc., Mechatrends Contractors Corp., Tata Motors, and Vitol Asia Pte Ltd.
Cooperators are Banco De Oro and Mercedes-Benz. Major sponsors are Brenton Engineered Products Corp., Charles Monat, Credit Suisse, Dalmore, Oriental Vehicle Corp., The Coffee Bean & Tea Leaf, Trans-Overseas Industrial Corp., and Visayan Surety & Insurance Corp.
Gold sponsors are Banana Telecommunications, Inc., EEI Construction and Marine, Inc., Ferrotech Steel, FSC Metal Corp., Global Gateway Development Corp (Clark Global City), Maybank ATR Kim Eng, Measurement & Controls Technology, Inc., NOVALCO, Phil Asia Logistics Inc., RealSoft, Inc., Schultz Rackow Gasteknik (ROTAREX), Seadove Maritime Services, Inc., The Fourth Dimension, Inc., and Trans-Asia Shipping Lines. Silver sponsors are Bank J. Safra Sarasin Ltd, Singapore Branch, Filipinas Aviation Services, Inc., International Engineers (Phil. ), Inc., Joytrade Industrial Marketing, Kewlsolutions Limited Co., Monark Equipment Corp., MT Holly Coco Industrial Inc., PetroLogistics Corp., Pirelli, and Worthrand Petropower Corp. Bronze sponsors are A. Medrano Construction Inc., AMN Marketing and Services, Anaplan, Asia United Bank, Bank of Commerce, Chelsea Logistics Corp., China Banking Corp., Connex Technology and Industrial Services, CTBC Bank (Philippines) Corp., Development Bank of the Philippines, F2 Logistics, FastTrack Solutions, Inc., Go Hotels, Land Bank of the Philippines, Lomar Supply Co. Inc., Maybank, Mithras Security Agency, Multinational Investment Bancorporation, PentaCapital Investment Corp., Philippine Business Bank, Philippine Global Coconut Oil Mill Inc., Philippine Veterans Bank, Phoenix LPG Philippines, Inc., Rain or Shine Elastropaint, Rizal Commercial Banking Corp., Simpson’s Philippines, Inc., UDENNA Corp., Union Bank of the Philippines, United Coconut Planters Bank, United Overseas Bank, Webb Fontaine Asia, Inc., and ZAF Builders. For more information, please contact the tournament organizer, Ms. Liloh Evangelista, at 0917-362-0880 or e-mail phoenix.opengolf@phoenixfuels.ph.